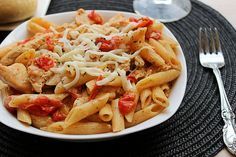 Pasta and Chicken are always a favorite at my house, and this dish is no exception. The fresh tastes of the tomatoes and basil come through. Using a store bought chicken broth makes this recipe ideal for the beginner cook; however, for an even better flavor, you might try making your own broth by simmering a whole chicken. Spray baker with olive oil spritzer. Slice or press garlic into baker Add tomatoes. Cover; microwave on HIGH 4-5 minutes or until tomatoes begin to burst, stirring after 2 minutes. Crush tomatoes. Add pasta, broth, wine, salt and black pepper. Return baker to microwave; cover and microwave on HIGH 16-18 minutes or until pasta is tender, stirring after 10 minutes. Meanwhile, coarsely chop basil. Reserve 2 tbsp for garnish. Grate cheese. Carefully remove baker from microwave and remove lid, lifting away from you. Add remaining basil, cheese and chicken to baker ; mix well. Garnish with reserved 2 tbsp basil, additional Parmesan cheese and black pepper, if desired. Cook’s Tips: An additional 3/4 cup chicken broth can be substituted for the wine, if desired. To grill chicken in a Grill Pan, season 2 chicken breasts, about 6 oz each, with salt and black pepper. Heat Grill Pan over medium-high heat 5 minutes. Spray pan with oil. Cook chicken 4-6 minutes or until grill marks appear. Turn chicken over; cook 4-6 minutes or until center of chicken is no longer pink and Digital Pocket Thermometer registers 170°F. Some really fantastic work on behalf of the owner of this website , dead great written content . Fantastic website. Lots of useful info here. I’m sending it to some pals ans also sharing in delicious. And of course, thanks to your effort!